The Israeli military is equipping its forces with a new range of spy drones small enough to fit in a soldier's backpack, the army said on Thursday. The small unmanned aerial vehicles (UAVs) and micro UAVs were unveiled at a conference on low intensity conflict. The Israeli air force has often used larger unmanned spy planes to target Palestinian militants in air strikes. The new baby drones would give army forces in the field near instant access to aerial intelligence. The planes have already been supplied to some ground units. "We use them to take aerial photographs of the (Palestinian) territories," a military official told Associated Press news agency. On display at the Tel Aviv conference were the Birdy and the Spy There mini-drones and two micro-drones, the Mosquito and the Mosquito 1.5. 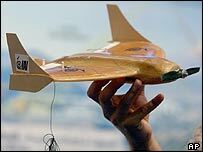 The models were developed by Israel Aircraft Industries' (IAI) engineering division. Birdy can be carried and launched by a single soldier, who guides the drone by clicking on coordinates on a laptop computer. It has a five-kilometre range (three miles), IAI said. The slightly larger Spy There is operated by a two man crew and has twice the range, IAI said. All the drones can fly for an hour while transmitting pictures back to their operators. The Mosquito 1 and Mosquito 1.5 micro-drones have a wingspan of 33 centimetres (13 inches). Their small size allows them to fly through windows and to provide images to military units behind it, Israeli newspaper Haaretz reported. The Mosquito has already completed several successful 40-minute trial flights, IAI said. The army currently rents the drones from IAI but has issued a contact offer to supply them with the small UAVs, the official told AP news agency.